An ever new Dubai is on the horizon. Once a city has earned itself the reputation of having the biggest and the best, it becomes difficult to stop expanding. Dubai is home to the world’s tallest building, the world’s tallest hotel, the world’s largest shopping mall, and the world’s biggest indoor ski-slope. 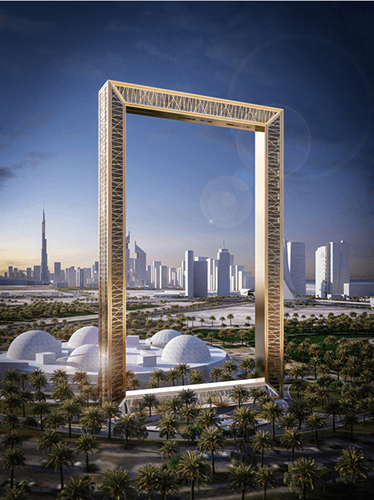 Dubai Frame, image courtesy of the Dubai Municipality. The most unique of the new projects currently underway is the “Dubai Frame,” which, as the name suggests, is essentially a massive window frame. The structure, scheduled to open in the second half of 2016, stands 105 meters tall on either side, connected by a 100-meter skywalk for visitors. A museum on the ground floor will seek to explain Dubai’s transformation from a sleepy fishing village to one of the world’s best-known cities. Integral to the design—which was chosen from among 926 proposals at the 2009 ThyssenKrupp Elevator International Award—is its location. Looking north through the frame, visitors are presented with a view of “Old Dubai,” characterized by its densely populated neighborhoods, traditional souks, and relatively long history. In contrast, looking south through the frame, visitors will see the glittery, opulent skyline of New Dubai, including its crown jewel, the 163-story Burj Khalifa. Dubai Opera House, image courtesy of Emaar. The 2,000 seat, Arabian dhow-shaped Dubai Opera House, which will open its doors in late 2016, is meant to be a multi-purpose, shape-shifting opera, theatre and concert venue, which, through an impressive design, can be re-configured into an exhibition or banquet hall. 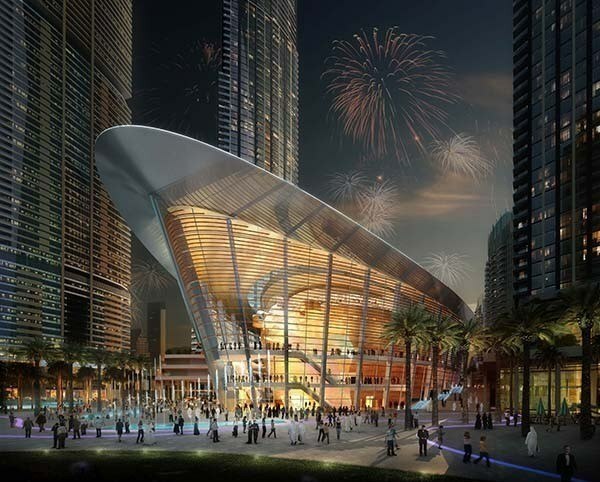 Some dedicated opera-goers, however, might scoff at the idea of an opera house being erected alongside the Dubai Mall. “It will be a Disney version of the opera, and nobody will go,” one exasperated expat recently told me. The opera, however, is nothing less than an attempt to transform the nature of tourism attracted to the area, which, as of now, is dominated by shopping. The Opera House will, developers say, be the centerpiece of a new, artsy “opera district,” featuring a museum of modern art, two “art hotels” and a number studios and galleries. The Opera House and District are both part of a growing effort by the UAE to import more culture into the country, which will now also include a franchise of the Guggenheim and of the Louvre in Abu Dhabi. In a clear effort to outdo the London Eye and the famous Las Vegas High Roller, Dubai is currently hard at work building the “Dubai Eye,” which, when completed later this year, will become the world’s largest Ferris wheel. The structure will stand at a total of 210 meters in height, dwarfing the London Eye’s 135 meters. Additionally, while the London Eye can carry about 825 people in 32 separate 25-person passenger pods, the bigger Dubai version will carry up to 1,200 people at a time in 48 “luxury” capsules. An 80-meter LED screen mounted on the wheel is expected to broadcast films, advertisements, and messages. The Dubai Eye is meant to be the crowning achievement of the Bluewaters Island project. The island will include entertainment venues, restaurants and shops, and is expected to attract approximately three million visitors each year. Meydan One, image courtesy of Meydan Sohba. Perhaps most representative of Dubai’s quest for grandeur is the Meydan One, which, when completed, will boast the world’s largest dancing fountain, world’s highest residential tower, and the world’s largest indoor ski slope. Meydan One’s 1.2 km indoor ski slope plans to attract professional-level skiers, stealing the “world’s biggest”-title from the slope at Dubai’s Mall of the Emirates. 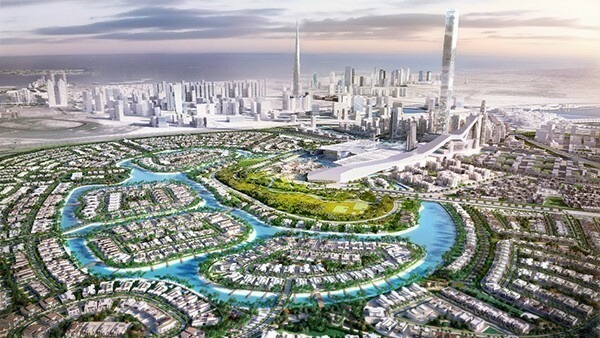 The 3.67 million-square foot “luxury district” will also feature a shopping mall with a retractable roof, a “civic plaza,” a 4-km long canal, a marina with 100 berths, and a 250,000 square-meter indoor sports arena. The 885-apartment Dubai One building will rise to an imposing 711 meters in height, with an observation deck at 655 meters and a “sky restaurant” at 675 meters. The dancing fountain will stretch 420 meters. The project is expected to open in time for Dubai’s Expo in 2020. 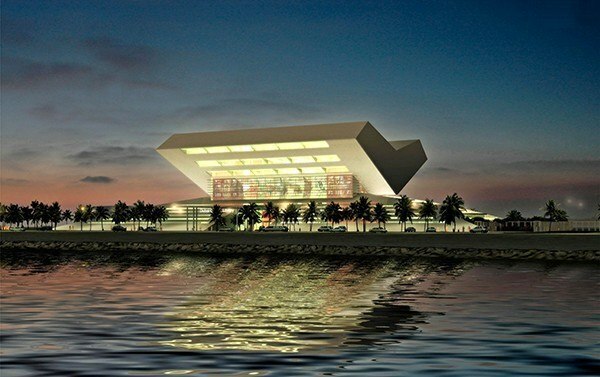 Mohammed bin Rashid Library, image courtesy of EdelmanDabo. Without a doubt the most admirable project currently underway is the recently revealed Mohammed bin Rashid Library, which aims to become the largest library and cultural center in the Middle East. Located in Dubai’s Al Jaddaf neighbourhood, the seven-story, one million square foot facility will store more than 4.5 million books (1.5 million physical books, 2.5 million digital books and one million audio books), as well as a 500-seat lecture theatre. The state-of-the-art library is part of Sheikh Mohammed’s drive to inculcate a love of reading in today’s youth, at a time when the region’s historic centers of learning – Baghdad, Aleppo, Damascus – are going through periods of civil strife and neglect. “We are the leaders of civilization, duty and culture, and so we need to revive the spirit of learning and curiosity within our culture through innovative initiatives that push our boundaries,” Sheikh Mohammed declared at the launch event. Dubai being Dubai, the library had to feature something unique: it is being built in the shape of an enormous open book.